A blue-ribbon horse and a boy with Down syndrome teach Skye the meaning of love. Joey Klingerman is one of the most loving kids you could ever meet, but Skye would welcome a lot less of his affection. This is Joey's second summer at Keystone Stables, and the outgoing boy has latched onto Skye as his 'girlfriend.' Skye finds his attention embarrassing and frustrating. To add to the frustration, Joey won't stop pestering Skye to let him ride her horse, Champ. Skye won't even consider it. No one rides Champ but her. What does God want her to learn about loving others---including Joey? With the Snyder County Horse Show drawing near, Skye is about to find out. 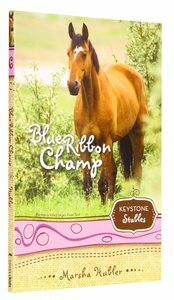 About "Blue Ribbon Champ (Formerly Skye's Final Test) (Keystone Stables Series)"
Thirteen-year-old foster kid Skye Nicholson has become an expert at being an angry, cold, and defensive teenager. She's been through so much and committed so many offences that she knows with her last antic, she's on her last leg. After breaking five foster home placements, she's headed to her final resort - juvenile detention. But, suddenly, hope finds her through the tough love of Tom and Eileen Chambers, whom offer her another chance, in their home. There she's introduced to a God that has the power to truly save her, no matter how much she thinks she's not worth saving.